Lateral epicondylitis, also known as "Tennis Elbow", is the most common overuse syndrome in the elbow. It is a tendinopathy injury involving the extensor muscles of the forearm. These muscles originate on the lateral epicondylar region of the distal humerus. 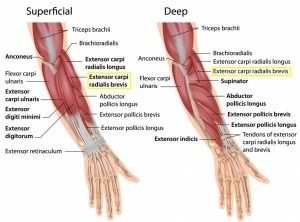 In a lot of cases, the insertion of the extensor carpi radialis brevis is involved. The elbow joint is made up of three bones: the humerus (upper arm bone), the radius and ulna (two bones in the forearm). 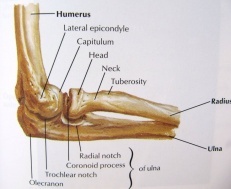 At the distal end of the humerus there are two epicondyles, one lateral (on the outside) and one medial (on the inside). The radial nerve is also in close proximity to this region, and divides into the superficial radial nerve and the posterior interosseous nerve. Lateral epicondylitis is classified as an overuse injury that may result in hyaline degeneration of the origin of the extensor tendon. 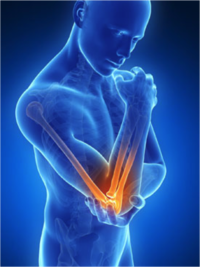 Overuse of the muscles and tendons of the forearm and elbow together with repetitive contractions or manual tasks can put too much strain on the elbow tendons. These contractions or manual tasks require manipulation of the hand that causes maladaptions in tendon structure that lead to pain over the lateral epicondyle. Mostly, the pain is located anterior and distal from the lateral epicondyle. A systematic review identified 3 risk factors: handling tools heavier than 1 kg, handling loads heavier than 20 kg at least 10 times per day, and repetitive movements for more than 2 hours per day. Other risk factors are overuse, repetitive movements, training errors, misalignments, flexibility problems, ageing, poor circulation, strength deficits or muscle imbalance and psychological factors. Nirschl and Pettrone attributed the cause to microscopic tearing with formation of reparative tissue (angiofibroblastic hyperplasia) in the origin of the extensor carpi radialis brevis (ECRB) muscle. This micro-tearing and repair response can lead to macroscopic tearing and structural failure of the origin of the ECRB muscle. That microscopic or macroscopic tears of the common extensor origin were involved in the disease process, was postulated by Cyriax in 1936. The first to describe macroscopic tearing in association with the histological findings were Coonrad and Hooper. Histology of tissue samples shows "collagen disorientation, disorganisation, and fibre separation by increased proteoglycan content, increased cellularity, neovascularisation, with local necrosis." Nirschl termed these histological findings bangiofibroblastic hyperplasia. The term has since been modified to bangiofibroblastic tendinosis. He noted that the tissue was characterised by disorganized, immature collagen formation with immature fibroblastic and vascular elements. This grey, friable tissue is found in association with varying degrees of tearing involving the extensor carpi radialis brevis. According to Warren, there are four stages on the development of this injury with regard to the intensity of the symptoms. 1. Faint pain a couple of hours after the provoking activity. 2. Pain at the end of or immediately after the provoking activity. 3. Pain during the provoking activity, which intensifies after ceasing that activity. 4. Constant pain, which prohibits any activity. A thorough assessment and examination are key elements in ensuring that the correct treatment plan is implemented, enhancing the recovery process. The assessment should also include elements to exclude a differential diagnosis. The diagnose starts with asking about the activity level , occupation risk factors, recreational sports participation, medication and other medical problems. During the physical exam, the medicine will feel the structure of the elbow and other joints. Also the nerves, muscles, bones and skin are examined. It’s important to know which activities cause symptoms and where on your arm the symptoms occur. Investigations are usually not performed in the straightforward case of lateral elbow pain. However, in longstanding cases, plain X-ray (AP and lateral views) of the elbow may show osteochondritis dissecans, degenerative joint changes or evidence of heterotopic calcification. Electromyography (EMG): An EMG is used to rule out nerve compression. Many nerves travel around the elbow, and the symptoms of nerve compression are similar to those of tennis elbow. To examine the severity of the tennis elbow, there is a dynamometer and a Patient-rated Tennis Elbow Evaluation Questionnaire (PrTEEQ). The dynamometer measures grip strength. The PrTEEQ is a 15-item questionnaire, it’s designed to measure forearm pain and disability in patients with lateral epicondylitis. The patients have to rate their levels of tennis elbow pain and disability from 0 to 10, and consists of 2 subscales. There is the pain subscale (0 = no pain, 10 = worst imaginable) en the function subscale (0 = no difficulty, 10 = unable to do). Maudsley’s test: The examiner resist extension of the third digit of the hand, while palpating the lateral epicondyle. A positive test is indicated by pain over the lateral epicondyle. The coffee cup test (by Coonrad and Hooper): While doing a specific activity such as picking up a full cup of coffee or a milk bottle. The patient is asked to rate their pain on a scale of zero to ten. Non-Operative medical management of lateral epicondylitis is initially based on the following principles: relieving pain and controlling inflammation. Relieving pain can be countered by rest and avoiding painful activities. Inflammation on the other hand can be prevented by NSAIDs in the acute cases. The use of ice three times per day for 15 minutes is also recommended because it reduces the inflammatory response by decreasing the level of chemical activity and by vasoconstriction, which reduces the swelling. Elevation of the extremity is also indicated if an oedema of the wrist or fingers is present. The use of an elbow counterforce brace can be helpful because it plays the role of a secondary muscle attachment site and relieves tension on the insertion at the lateral epicondyle. The brace is applied around the forearm (below the head of the radius) and is tightened enough so that, when the patient contracts the wrist extensors, he or she does not fully contract the muscles. Injections should be given subperiosteally to the extensor brevis origin. These injections have an early and beneficial effect. During the initial 24-28 hours, increased pain be experienced. A steroid injection should be followed by 1-2 weeks’ rest and should not be repeated more than 2 times. Steroid injection seems to be effective for about 3 months, indicating that the patient must continue with the exercise program. If the symptoms of epicondylitis lateralis will prove to be resistant surgical treatment is indicated. Usually this is after a failed conservative treatment for more than 6 months. Most surgical procedures for tennis elbow involve removing diseased muscle and reattaching healthy muscle back to bone. The right surgical approach for you will depend on a range of factors. These include the scope of your injury, your general health, and your personal needs. Arthroscopic surgery. 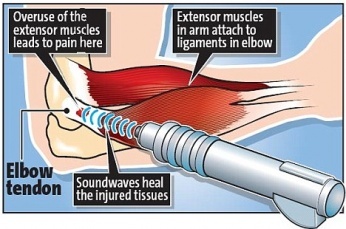 Tennis elbow can also be repaired using tiny instruments and small incisions. Like open surgery, this is a same-day or outpatient procedure. Corticosteroid injections have a short-term beneficial effect on lateral epicondylitis, but a negative effect in the intermediate term. Evidence on the long-term effect is conflicting. Manipulation and exercise and exercise and stretching have a short-term effect, with the latter also having a long-term effect. Physical therapy management including only the use of "Therapeutic Ultrasound for Lateral Epicondylitis', massage, and exercise has been shown to be no better than a "wait and see" treatment method. Activity modification, when possible, can help prevent recurrent episodes of lateral epicondylalgia, as well as use of a counterforce brace as needed. Shockwave Therapy is a method of treatment for multiple tendonopathies that can be used for the treatment of lateral epicondylitis. ESTW is a treatment technique in which patients are exposed to a strong mechanical wave impulses which can be used on a fairly accurate position. here are several studies that examine the effects of extracorporeal shockwave on lateral epicondylitis. Statistical analysis of visual analogue scale (VAS), disabilities of the arm, shoulder, and hand (DASH) questionnaire and pain-free grip strength test scores has shown, both after treatment and to the follow-up at 6 months, significant difference comparing study group versus control group (P <0.001)  .The use of RSWT allowed a decrease of pain, and functional impairment, and an increase of the pain-free grip strength test, in patients with tennis elbow. It’s a very common intervention that combines the use of deep transverse friction (DTF) with Mill’s manipulations, which was used with success by Cyriax and Cyriax for treating lateral epicondylitis. Both the treatment components mentioned above must be used jointly in the sequence specified. Patient must follow the protocol three times a week for four weeks. There are several contraindications regard to this therapy: active infections, bursitis, disorders of the nerve structures, ossification and calcification of the soft tissues, active rheumatoid arthritis, anticoagulant. The purpose of the deep friction massage is to maintain the mobility within the soft tissue structures. It seems to have a pain relief function, due to modulation of the nociceptive impulses (gate control theory), a better alignment of connective tissue fibrils, softens the scar tissue, and blood flow increases, but further studies are needed. The patient should be positioned with arm fully supinated in 90° of elbow flexion, identify the area of tenderness on the lateral epicondyle and apply pressure (DTF), with the tip of the thumb on the lateral epicondyle, in a posterior direction on the teno-osseous junction. The other hand stabilized the patient’s wrist. Mill’s intention was to shift the annular ligament and replace it. Cyriax found out that the annular ligament applies the greatest possible stretching tension to the extensor carpi radialis muscles, that’s why the manipulative procedure should be carried out with a sharp jerk, in order to open the tear in the tendon and relieve tension on the tendon scar by converting a tear. Patient seated with the affected extremity in 90° abduction and internal rotation (olecranon faced up).Therapist stands behind the patient , stabilized the patient’s wrist in full pronation and flexion, while the other hand is placed on the olecranon. The maintenance of full wrist flexion is important as failure to maintain this position could lead to a majority of the thrusting force being bome by the humeroulnar joint. The high-velocity low amplitude (HVLA) thrust at the end range of elbow extension, is a quick movement in the direction illustrated. This manipulation may produce mild discomfort at the instant of its performance. The clinician applies this procedure a 2-3 times a week until cure, with a range of 4-12 sessions. Exercise therapy is a regimen or plan of physical activities designed and prescribed for specific therapeutic goals. Its purpose is to restore normal musculoskeletal function or to reduce pain caused by diseases or injuries. The underlying principle of the stretching phase is that , by lengthening the tendon during relaxation, we can reduce its stretching during offending movements. The best stretching position for the Extensor Carpi Radialis Brevis tendon, is reached with the elbow in extension, forearm in pronation, wrist in flexion and with ulnar deviation of the wrist, according to the patient’s tolerance. This stretching should be held for 30- 45 s and 3 times before and after the eccentric exercises, during each treatment session with a 30 s rest interval. There are three principles of eccentric exercises. These are load ( resistance), speed (velocity) and frequency of contractions. Load ( resistance): Increasing the load ensures the tendon is subjected to greater stress and forms the fundamental basis of the progression of the exercise programme. The basis of all physical training programmes is formed by this principle of progressive overloading. According to the patient’s symptoms, it is important that the load of these eccentric exercises should be increased. If it’s not increased then the possibility of re-injury will be high. Speed ( velocity): The speed (velocity) of contractions is also a fundamental principle of successful eccentric exercises. In each treatment session the speed of the eccentric training should be increased. Hence the load on the tendon increases to stimulate the mechanism of the injury. However the therapists must ensure that the patients perform the eccentric exercises slowly to avoid pain. Frequency of contractions: The frequency of contractions is the third principle of eccentric exercises. There can be variations of sets and repetitions in the literature. According to the therapists 3 sets of 10 repetitions can normally be performed without overloading the injured tendon, as determined by the tolerance of the patient. The elbow is in full extension, forearm in pronation and the arm is supported. The greatest strengthening result for the extensor tendons of the wrist is reached in this position. This is a recommendation and the frequency must be patient specific. 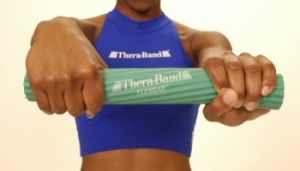 Theraband exercises (or exercises with a small weight) are performed each day for 3 sets of 10. You fix one side of the theraband under you feet or another place and you take the other side in your hand or you have a small weight in your hand. In this study the subjects were assigned to group A or group B. Group A received supervised therapeutic exercise program which included static stretching of the Extensor Carpi Radialis Brevis followed by eccentric strengthening of the wrist extensors. Group B was treated with Cyriax physiotherapy. The groups that performed supervised exercise program (group A) for 4 weeks showed significantly greater improvement in reduction of pain and functional status than the Cyriax physiotherapy treatment. Hold FlexBar® in the affected (right) hand. Make sure it's in full wrist extension.. The other end of the device must be held with your unaffected (left) hand. Twist FlexBar® with unaffected wrist while holding. The FlexBar® exercise is performed each day for 3 sets of 15. It takes 4 seconds to complete each repetition and between each set of 15 repetitions there is 30 seconds of rest. Once the patients can perform 3 sets of 15, they progress to another colour FlexBar® with a higher intensity of eccentric resistance.The treatment continued until the patient had a resolution of symptoms, which occurred at an average of 7 weeks of treatment with 10 clinic visits. The treatment should be continued until this resolution occurs. The treatment should be continued until this resolution occurs. 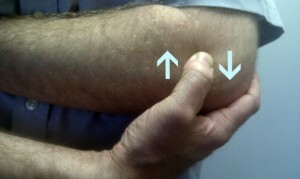 Lateral epicondylitis is the most common overuse syndrome in the elbow. It is an injury involving the extensor muscles of the forearm. In a lot of cases, the insertion of the extensor carpi radialis brevis is involved. Contractile overloads that chronically tension or stress the tendon near the attachment on the humerus are the primary cause of epicondylitis. It occurs often in repetitive upper extremity activities such as computer use, heavy lifting, forceful forearm pronation and supination, and repetitive vibration. Medical management consist of NSAID, ice, elevation and the use of an elbow counterforce brace. If the symptoms will prove to be resistant surgical treatment is indicated. 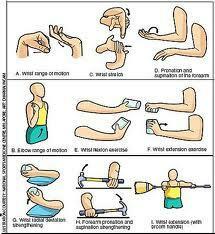 Concerning physical management there are different types of therapies to treat lateral epicondylitis. The most important methods are: Cyriax therapy, stretching and exercises with the Flexbar. ↑ 3.0 3.1 3.2 3.3 3.4 3.5 3.6 Tuomo Pienimäki, M.D Ph.D et al. Associations Between Pain, Grip Strength, and Manual Tests in the Treatment Evaluation of Chronic Tennis Elbow . The clinical journal of pain 18: 164-170 2002. Level of Evidence: 3B. ↑ 4.0 4.1 4.2 4.3 4.4 4.5 Whaley AL, Baker CL. Lateral epicondylitis. Clin Sports Med 2004;23:677– 691. Level of Evidence: 1C. ↑ 5.0 5.1 Phil Page., a new exercise for tennis elbow that works, N Am J Sports Phys Ther. 2010 Sep; 5(3): 189–193. Level of Evidence: 1A. ↑ D. Stasinopoulos et al, Cyriax physiotherapy for tennis elbow/lateral epicondylitis, 2004, British Journal of Sports Medicine. Level of Evidence: 1B. ↑ Nirschl RP. Tennis elbow. Orthop North Am. 1973;4:787-99. ↑ 11.0 11.1 11.2 11.3 Baker CL, Plancher KD. Operative treatment of elbow injuries. New York: Springer, 2002. ↑ Wright JG. Evidence-based orthopaedics: the best answers to clinical questions. Philadelphia: Saunders Elsevier, 2008. ↑ 18.0 18.1 Nirschl RP, Ashman ES. Elbow tendinopathy: tennis elbow. Clinics in sports medicine. 2003 Oct 1;22(4):813-36. ↑ 19.0 19.1 19.2 19.3 19.4 19.5 Brukner P. Brukner & Khan's clinical sports medicine. North Ryde: McGraw-Hill; 2012. ↑ Leung HB, Yen CH, Tse PYT. Reliability of Hong Kong Chinese version of the Patient ratedfckLRForearm Evaluation Questionnaire for lateral epicondylitis. Hong Kong Med J 2004;10:172-7. ↑ Newcomer KL, Martinez-Silvestrini JA, Schaefer MP, Gay RE, Arendt KW. Sensitivity of the Patient-rated Forearm Evaluation Questionnaire in lateral epicondylitis. J Hand Ther 2005;18:400-6. ↑ Overend TJ, Wuori-Fearn JL, Kramer JF, MacDermid JC. Reliability of a patient-rated forearm evaluation questionnaire for patients with lateral epicondylitis. J Hand Ther 1999;12:31-7. ↑ Mathiowetz V. Comparison of Rolyan and Jamar dynamometers for measuring grip strength. Occup Ther Int. 2002;9(3):201-9. ↑ Bhargava AS, Eapen C, Kumar SP. Grip strength measurements at two different wrist extension positions in chronic lateral epicondylitis-comparison of involved vs. uninvolved side in athletes and non athletes: a case-control study. Sports Med Arthrosc Rehabil Ther Technol. 2010 Sep 7;2:22. ↑ Cleland JA, Flynn TW, Palmer JA. Incorporation of manual therapy directed at the cervicothoracic spine in patients with lateral epicondylalgia: a pilot clinical trial. J Man and Manip Ther. 2005;13(3):143-151. ↑ Smidt N, Van der Windt DAWM, Assendelft WJJ, Deville WLFM, Korthals-de Bos IBC, Bouter LM. Corticosteroid injections, physiotherapy, or a wait-and-see policy for lateral epicondylitis: a randomised controlled trial. LANCET. 2002;359:657-662. ↑ 39.0 39.1 Hammer DS, Rupp S, Ensslin S, Kohn D, Seil R. Extracorporal shock wave therapy in patients with tennis elbow and painful heel. Archives of orthopaedic and trauma surgery. 2000 Apr 8;120(5):304-7. ↑ 40.0 40.1 Crowther MA, Bannister GC, Huma H, Rooker GD. A prospective, randomised study to compare extracorporeal shock-wave therapy and injection of steroid for the treatment of tennis elbow. Bone & Joint Journal. 2002 Jul 1;84(5):678-9. ↑ 41.0 41.1 Rompe JD, Hopf C, Küllmer K, Heine J, Bürger R, Nafe B. Low-energy extracorporal shock wave therapy for persistent tennis elbow. International orthopaedics. 1996 Feb 1;20(1):23-7. ↑ 42.0 42.1 Krischek O, Hopf C, Nafe B, Rompe JD. Shock-wave therapy for tennis and golfer’s elbow–1 year follow-up. Archives of orthopaedic and trauma surgery. 1999 Feb 8;119(1):62-6. ↑ 43.0 43.1 Stasinopoulos, D. and Johnson, M.I., 2005. Effectiveness of extracorporeal shock wave therapy for tennis elbow (lateral epicondylitis). British journal of sports medicine, 39(3), pp.132-136. ↑ Phil Page., a new exercise for tennis elbow that works, N Am J Sports Phys Ther. 2010 Sep; 5(3): 189–193. Level of Evidence: 1A. ↑ James Walrod, MD, Craig C Young et al. Lateral epicondilitis; Medscape ; 2015. Level of Evidence: 1A. ↑ 53.0 53.1 Stanish WD, Rubinovich RM, Curwin S. Eccentric exercise in chronic tendinitis. Clinical orthopaedics and related research. 1986 Jul 1;208:65-8.